Hi all my wonderful readers. I hope you’re all having a fantastic day. Last week, I was very kindly invited to the Nouveau Lashes event in Leeds, and I thought I would share with you what I thought. If you have never heard of Nouveau Lashes, then here’s a little back story. Nouveau Lashes was launched in 2005 by two beauty industry pioneers called Karen Betts, and Bridgette Softley. Nouveau Lashes started with a simple aim, to bring every woman beautiful lashes. Today, Nouveau Lashes is a global brand with professional lash treatments for anyone. Nouveau Lashes can last anywhere from one night to eight weeks. Whether you want to just enhance your natural lashes, add va va voom for a special occasion, or want to extend your natural lashes with individual lash extensions, Nouveau Lashes have everything you need. To guarentee the best results every time. Nouveau Lashes lead the way in professional salon standards and training. Nouveau Lashes have also reinvented the approach to aftercare and support. That way, when you choose Nouveau Lashes, you don’t have to worry about the risk damages, and you also have peace of mind that your lashes will look their best for longer. That’s Nouveau Lashes story. Let me move onto the lovely event. The event was held at the fabulous Malmaison Leeds Hotel. Which by the way, is gorgeous and very high market. We did have a little bit of a technical issue trying to find it though, but we got their in the end. We did however bump into two amazing bloggers, Keliey and Toni, who I have been following and reading for ages, so that was a massive boost. We headed in and wondered around trying to find reception. Once reception was located, we was told to go to the first floor and that’s where the event was. Upon entering the massive room where the event was held, we was greeted by a wonderfully friendly woman named Claire. She was from Propaganda, the PR Company behind the event. Claire said that we could just sit down anywhere, and she also asked us if we would like a drink. 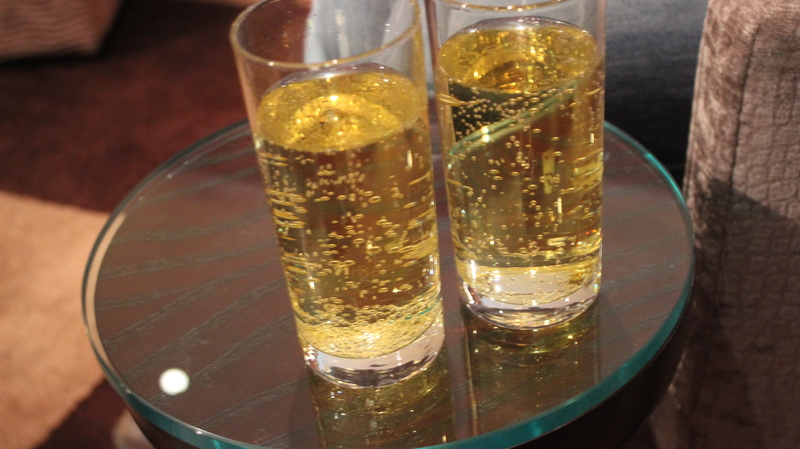 After the amazing barman told us what was on offer, we settled on Appletiser. After about 10 minutes or so, a whole host of other amazing bloggers started arriving. 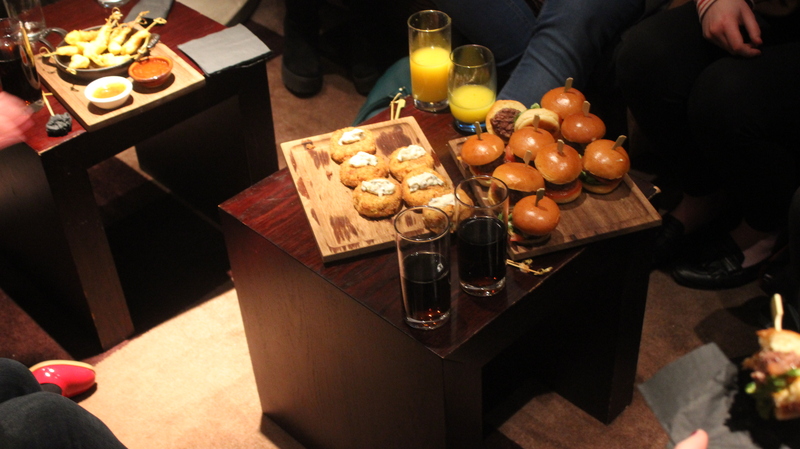 After all of the other bloggers arrived, all of the lovely canapes were served. Unfortunately I couldn’t really have anything as they served Prawns and Cheese, and we all know my problems with those. They did look lovely though. I did manage to have a few things. One of which, was a kind of marshmallow coconut cake. It was a little like a snowball, except it was inside a cake. After all the lovely food had been eaten, we moved onto the presentation area. The presentation got a little delayed due to a little technical issue. After hall that had been sorted, the presentation could begin. The Nouveau Lashes representative started talking about the story behind the brand, and all the market research they had done to make the brand better. She talked all about the many different lashes and treatments they offer, and how Nouveau is one of the market leaders in lash training. After all that had been explained, she told us all about what was going to be happening for the rest of the event. After that, we all rushed to a little demonstration of one of the technicians applying lashes to a willing participate. As she was doing the demonstration, she explained all about how to identify what eye shape you are, and gave a few tips on how to apply the lashes. After she had finished the demonstration, we were all told to find a station and give it a try. Obviously being blind as a bat, me trying to apply lashes would have gone so so wrong, but watching Jamie trying to apply them was hilarious! First he had to look at a sheet and try to identify what eye shape he is. Turns out he’s an Almond. Then he had to put the lashes up to his eyes and make sure the lashes were the right size for his eyes. They weren’t so he had to cut them down to fit his eyes. The next step was to actually use the glue and apply them to his eyes. Unfortunately after trying to line them up with his natural lashes, it proved a little difficult and this is where he stopped. After Jamie had finished, we decided to wonder around and see what everyone else was up to. There was many scenes of people trying to apply the wonderful eyelashes, and it turns out that many of them were struggling too. 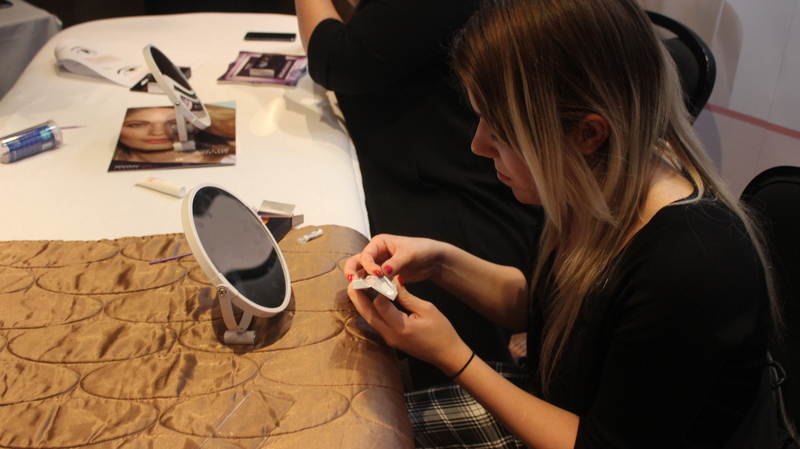 We wondered around a little more, and saw more technicians and bloggers applying lashes. It was getting near to the end of the event, and we stumbled upon Kellie again. It turns out she was getting one of their special lash extension treatments. We hung around a while and saw the technician seriously concerntrating on trying to put the little lashes onto Kellie. It took her a little while and she was done. Kellie’s eyes looked out of this world, and you really couldn’t tell where her lashes ended and the extensions began. It was a bit of a strange thing for two blokes to be at a lash event, but overall I had a really good time. If you haven’t already checked out Nouveau Lashes, then please do. They are a fantastic brand that offer excellent quality at an extremely affordable price. The fantastic people over at Nouveau Lashes are offering you all 20% off their express strip lashes as a consumer. All you have to do is enter the code LASHESLIVE20 at checkout. This code is only valid from the 7th April to the 20th April, and there’s no limit on the amount of times you can use it. That means you get an even better price on some already affordable amazing lashes. I just want to say a massive thank you to the people over at Nouveau Lashes, and Propaganda for inviting me to a really cool event. Do you use false lashes? What are your favourite kind to use? Do you have any tips to apply them? Please let me know down below.